If you are looking for a simple comfort food for dinner or a delicious way to make the best use of leftovers, you are looking for Shepherd's pie. Traditionally, there was a different name for this pie depending upon what you filled it with. A pie filled with beef and topped with mashed potatoes was called cottage pie while the same type of pie filled with lamb or mutton was called shepherd's pie. I suppose that's because a shepherd would have more lamb or mutton available than they would have beef. Nowadays, any pie that is topped with mashed potatoes is called shepherd's pie even if it is filled with vegetables. I have even had a pie that was filled with capocolla, prosciutto, provolone, and mozzarella that was more of an Italian hero pie than a shepherd's pie. I like to use a small amount of mashed potatoes as a bottom crust as well as topping the pie with mashed potatoes, but this is entirely up to the cook. I also like to use a pie pan to make my shepherds pie, but if you need to make a larger pie, or just don't happen to have a pie pan handy, any baking dish can be used. If you are feeding a lot of people, a 9x13 baking dish will work well. Let's say that you have some roast beef leftover from a big Sunday dinner or maybe you made a nice meatloaf with mashed potatoes and gravy and you have about half of it leftover. 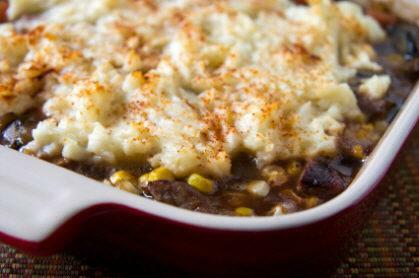 If you are short on time but long on leftovers, a shepherd's pie is just the thing. If you are using leftovers to make your shepherd's pie, you don't need to cook the meat again but you might want to sauté some vegetables to add to the meat. This recipe is written with leftovers in mind, but you can use fresh ground beef or lamb if you like. You can also use leftover stew. Just chop up the stew meat and skip the sauté part. This recipe is for a 9x13 baking dish. Melt half of the butter in a large pan over a medium-low heat. Sauté the onion in the butter until tender. Then add the carrots and continue to sauté for another ten minutes. If you are using fresh meat, add it now and cook until browned. Carefully drain the fat from the pan. If you are using leftover meat, now is the time to add it. Continue to cook until the meat is heated through. Add the gravy or beef stock and cook until fully heated. Cover evenly with a layer of mashed potatoes. Dab the potatoes with the remaining butter. Bake for 30 minutes until heated through. There seems to be a different shepherd's pie recipe for every vegetable and, truly, the variations are endless. If you are looking for a vegetarian pie that looks like a meat pie, simply replace the meat with minced Portobello mushrooms and use vegetable stock rather than beef stock. Add the mushrooms to the onions and follow the rest of the recipe. To help thicken the stock and make a more convincing gravy, add a ¼ cup of flour to the pan and cook to create a roux before adding the stock. Your family might even like this version better. If Portobello mushrooms are not available, button mushrooms work just as well.